Snapshot of a ship crossing the Atlantic ocean headed toward Halifax. 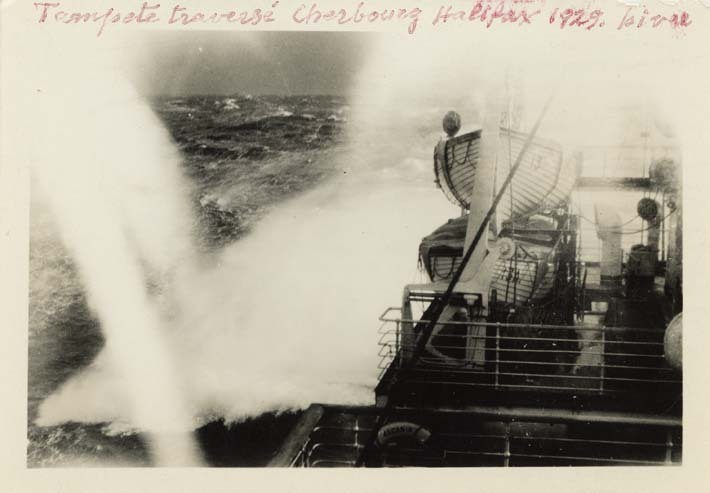 Photograph was taken by artist Vincenzo Poggi while he was aboard the Ascania, travelling from Cherbourg, France to Halifax, Nova Scotia in the late 1920s. The date on the photograph is February 1929, however records at Pier 21 indicate this ship did carry passengers to Halifax in 1929, but did so in 1928 and 1930. The photograph itself shows the ship crashing through rough waters, with a wave visible on the left. Two lifeboats are visible at the right. (top, handwritten in black pen) [in Italian] Tempesta sul mare a 200 miglia da / Halifax sull'Ascania. Febbraio. 1929.